Sometimes my group members have to reloadui to get this addon to start back working. Particularly at the second boss of vMoL, it takes a reload to get the notifications to show sometimes. Is that fixed in this version? That is being worked on. 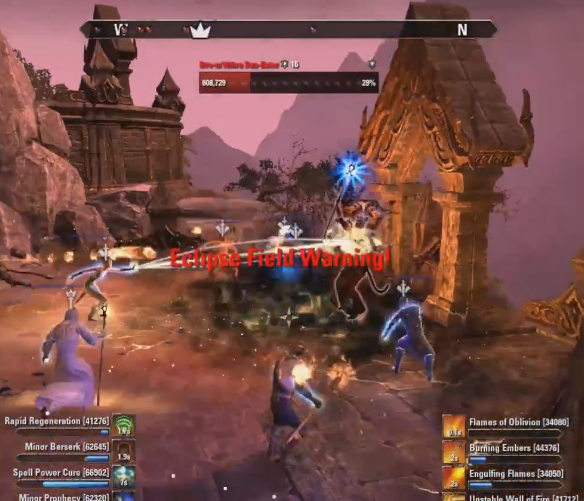 The problem is people that crash/dc/port out of the raid. So, people that crash/dc/port need to reloadui or everyone needs to reloadui if someone crash/dc/port? Just those that crash, and reloading needs to be done in the trial instance. Last edited by Woeler : 04/23/16 at 10:52 AM. Okay thanks for the info. I will pass along to my guild. It means I forgot to check for nil (aka, nothing) before comparing it. can you add an option, to check food/drink in pledges too? Can I ask a noob question? Unfortunately I am not able to have the raid warnings in the middle of my screen, just like you have on your posted screenshot. I cannot find an option to change the position where it shows (for me top left corner). 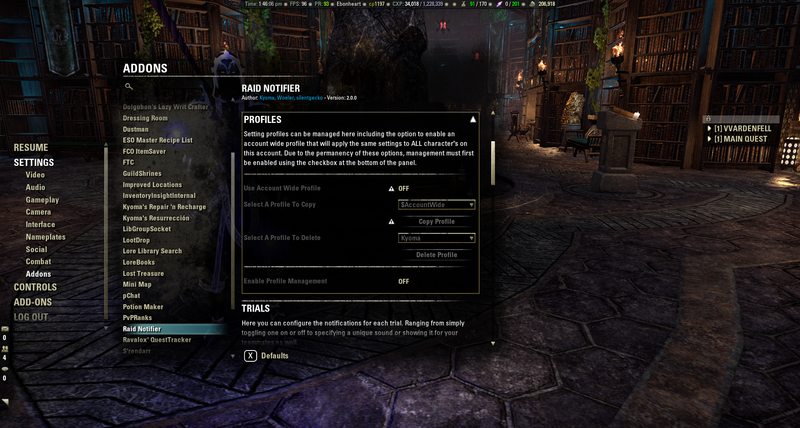 Can it be that other addons suppress the position where it shows or should i use a specific setting in the Eso General Settings? Last edited by Maxime : 06/16/16 at 01:58 AM. notifications only work in real trials. I'm pretty sure you are running the normal modes of SO or MOL then? Those are not "real" trials but rather 12-man dungeons. Does this addon have any vDSA exclusive notifications like maybe poison aoe spawn warning or Hiath Battlemaster fire AOE phase warning etc. or in there it supports basic functions only (food/drink time, pets, assistants)? There are currently no custom notifications for DSA. Maybe after it has been upscaled to cp160. Hey, fantastic addon. I have a suggestion for the False Twin Moons fight in VMOL with the Aspects - have the notifier text of your addon remain persistently on the screen as opposed to fading away. I've found that the game often has a visual bug that does not permit me to see the Aspect debuff on my character's head (even though others can see it), so I have no way of visually telling in the moment what boss to attack/side to move to. Having an option for persistent Aspect notifier text on the screen would really help with that. Cheers. I have the switch "Troll Boulder Toss" set to off (vSO). It still displays the notification. Last edited by Nichts : 09/05/16 at 04:48 PM. Addon does not recognise drinks that also give buff to max hp/stam/magicka as a buff food and will display "you didnt take buff food" notification all the time. Last edited by : 10/23/16 at 09:40 AM.